Among many International Criminal Court-related developments deserving note: following an Executive Council meeting this summer in Malabo, Equatorial Guinea, the African Union made public its support for Fatou Bensouda (left) to be the ICC's Prosecutor. The Assembly of States Parties is slated to elect a successor to the court's 1st Prosecutor this December, as we've posted, and Gambia-born Bensouda is among the candidates under consideration by an Assembly search committee. 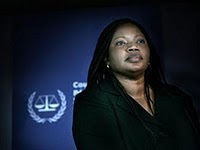 Since the Assembly elected her Deputy Prosecutor in 2004, Bensouda (prior IntLawGrrls posts) has been in charge of the Prosecution Division of the Office of the Prosecutor. Previously, she'd served been a private-sector and government attorney; positions included Solicitor General and Legal Secretary, as well as Attorney General and Minister of Justice, for the Republic of The Gambia. She'd also practiced at the International Criminal Tribunal for Rwanda, where she was Senior Legal Advisor and Head of The Legal Advisory Unit. The endorsement came "in conformity with African Union procedures for consideration and determination of African candidatures within the international system," the notice continued. Then followed endorsements for other posts, among them Justice Vinod Boolell of Mauritius, a jurist with considerable human rights and humanitarian law experience, for an ICC judgeship. ICC-watchers await more election news.